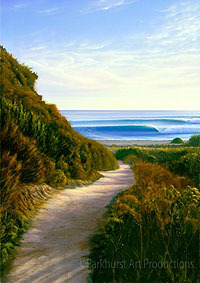 Born and raised in Manhattan Beach, California, James was inspired at an early age to cultivate his artist abilities. His love and respect for the ocean began at the age of four, when his father first taught him to bodysurf. 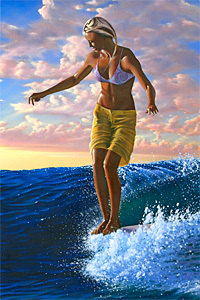 Throughout his high school years, James gained an incredible love and passion for surfing, and knew his desire to communicate this love could also be achieved through his art. After high school, James traveled extensively throughout the West Coast, hitchhiking up to Canada and backpacking throughout the Sierra Nevada. 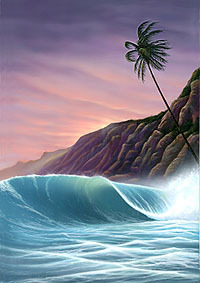 This provided James a greater love and passion of surfing and allowed him the opportunity to grow in all area of his art. He also took many surfing trips to Mexico, and given a rare opportunity, went to work on a tuna boat in Central America. 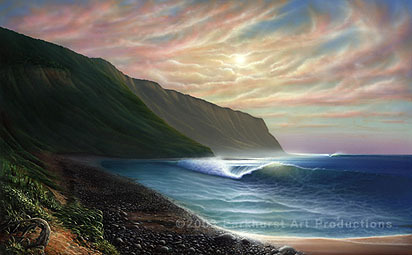 This experience instilled an even deeper love and respect for the ocean, which are evident in his earlier paintings. 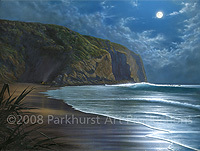 His work as a tuna fisherman also took him as far as New Zealand, where he lived, worked and painted for a year. Upon James' return from New Zealand, he attended Otis Parsons College of Art & Design and ultimately received his Bachelor of Fine Arts degree in Visual Communications at California State University, Long Beach. Since then he has worked as an Art Director for various advertising agencies both large and small, winning numerous awards for his creativity. 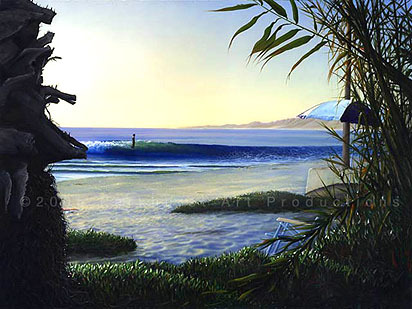 Living in San Clemente, James continues to gain recognition for his work. He continually pursues and fine-tunes his artistry by exploring a world filled with infinite visual emotions and by transmitting that spiritual essence to us all. 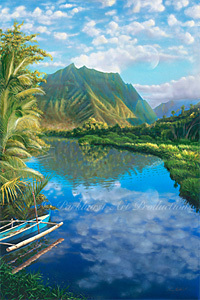 "I am not only looking to create a beautiful scene," he states, "but to capture God's poetry that exists there as well. ".